Paper mache clay may be used to mold sculptures and make masks. Paper mache clay can be used in the place of traditional moistened newspaper strips and dries much harder, too. This guide is about paper mache clay recipes. Does anyone have a recipe for papier mache clay? Make a form from wire, wadded newspaper, stuffed paper bags, or balloons. For a flat piece, such as a dollhouse or box, you can use a piece of cardboard. Tear newspaper into strips. Narrower strips work best for a rounded mold and larger strips are good for flat or rectangular shapes. Choose one of the following recipes to make the paste. Dip strips into paste, coating completely, squeezing out excess paste with your fingers. Use the strips to cover your pre-made form. If you overlap the strips, your finished product will look smoother. Allow each layer to dry before adding another layer. Cover your form with at least 2 layers. Soak papers in water in container. Reduce to pulp by tearing and stirring with spoon. Drain. Mix in thick paste of flour, water, and a little salt. 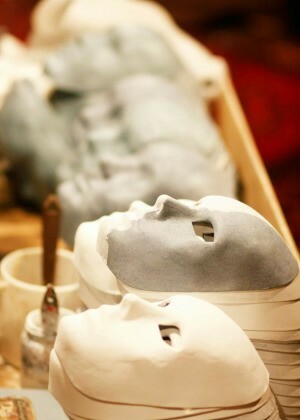 Stir until paper mache begins to feel like clay. Use as clay. It will squish through wire forms. There will be some shrinking as mache dries. Mix together the flour and cold water in a bowl. Add boiling water to this mixture, and return to a boil. Remove from heat and stir in the sugar. The mixture will thicken as it cools. In humid climates, try powdered non-porous wall paper adhesive mixed with water. Mix together the wheat paste and water in a bowl. The mixture will thicken as it cools.good luck.